That changed on June 16th 1966, with a mimed studio performance of new single Paperback Writer and Rain. The Beatles had agreed two days previously, when manager Brian Epstein passed on a request from Top Of The Pops producer Johnnie Stewart. Unusually, on this occasion The Beatles agreed. 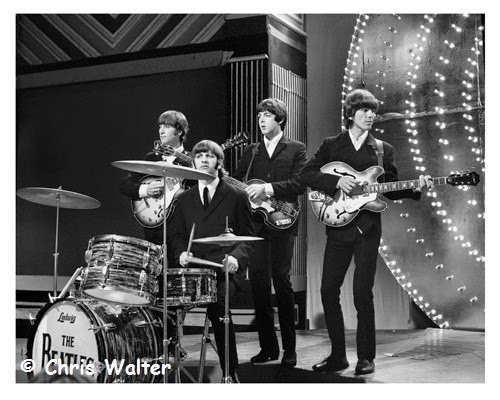 The Beatles' only live appearance on Top Of The Pops was, with the exception of the worldwide satellite transmission of All You Need Is Love on 25 June 1967, also their final live television appearance as a group. Two months later they did their final brief tour in the US with their last official concert in San Francisco on August 29th. Currently Available print no: ? In September 1967 the Beatles spent three days in Cornwall, England filming the Magical Mystery Tour. 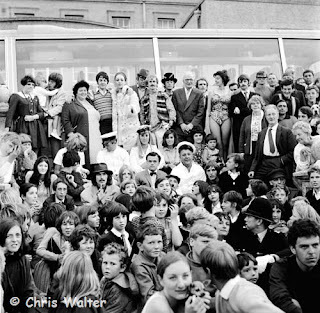 One of the scenes involved the group, cast, and surprised tourists in a 'family' group shot in front of the bus. Sizes 16x16, 20x20, also 24x24 and 30x30 at events.